Ricotta cheese has a wonderful clean, light flavour and it also has a pleasing creamy texture which worked very well in our tart. 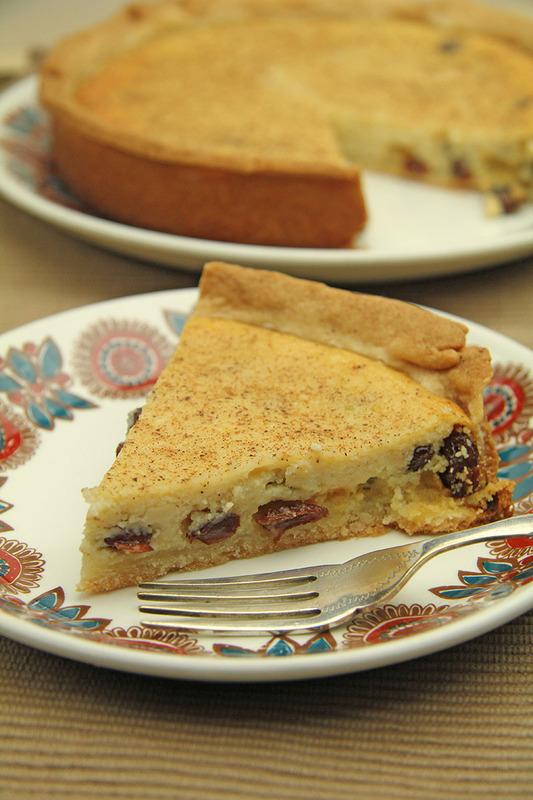 With added flavours of fresh lemon, warming nutmeg and rich fruity raisins, the tart is a real treat. Being very much like a baked cheesecake in texture crossed with the flavours of a traditional egg custard tart, there’s something for everyone. Please excuse us for not making our pastry but like many people these days we don’t always have much time to spare. Besides it is possible to buy very good quality sweet shortcrust pastry dough. 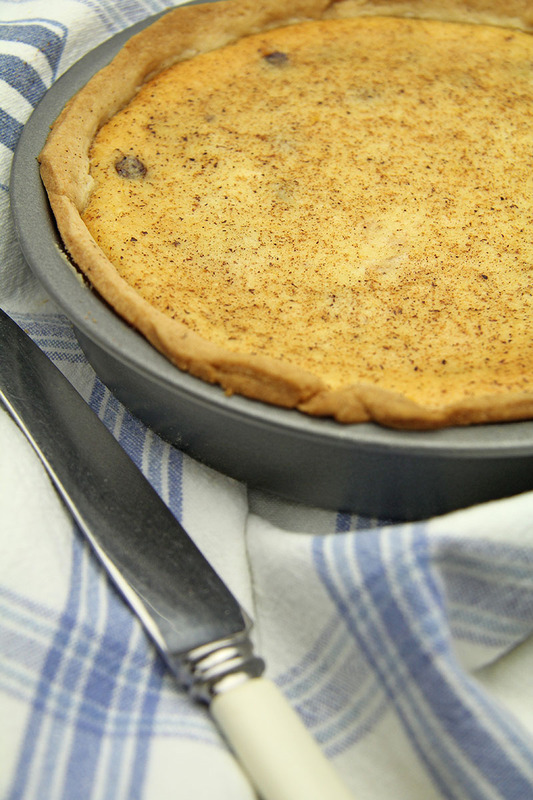 Roll out the pastry thinly and line a 17 cm loose-bottomed flan tin. Prick the pastry base lightly all over with a fork. Place in the refrigerator to chill. Place the ricotta in a large bowl and beat until smooth. Add the sugar and carry on beating until the mixture is light and fluffy. Grate in the zest of the whole lemon and then beat in the eggs one at a time until well combined. Add a pinch of salt, squeeze in all the juice of the lemon, add the vanilla extract, grate in a generous amount of nutmeg and drop in the raisins. Stir well until everything is well mixed. Pour the mixture into the pastry shell and grate over some nutmeg. Place in the oven and bake for 15 minutes then reduce the heat to 190C / Gas 5 and continue baking for 35 minutes. The flan is done when the pastry is crisp and cooked and the filling is golden with a very slight wobble in the centre. Leave the tart to cool in the tin for 10 minutes before removing from the tin.